A war memorial is shaped like a cross. Is that a problem? 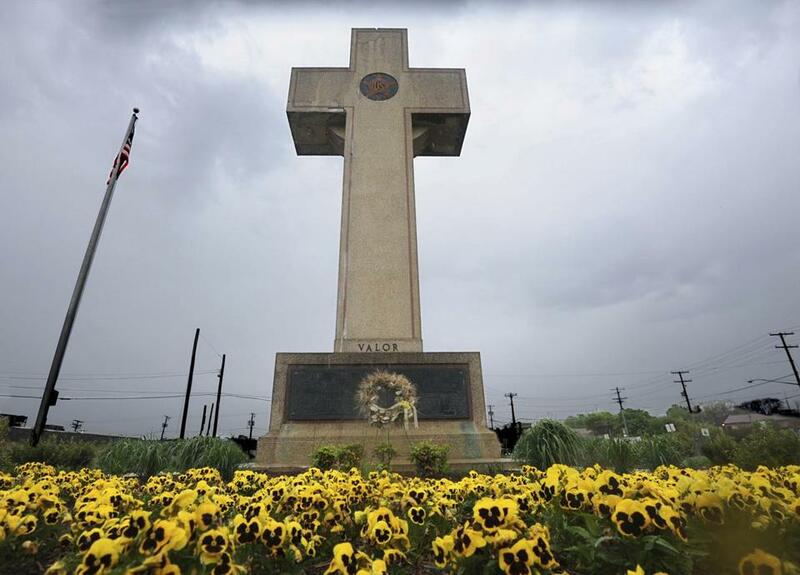 The World War I memorial cross in Bladensburg, Md. To honor the memory of 49 men from Prince George’s County, Md., killed during World War I, a 40-foot memorial cross made of concrete and pink granite has stood for nearly 100 years at an intersection in the town of Bladensburg near Washington, D.C. Though it was erected with private funds, the cross stands on public land, and since 1961 has been maintained by a state agency. The Supreme Court has agreed to decide next year whether the Bladensburg Peace Cross violates the First Amendment, which prohibits government from any “establishment of religion.” The legal challenge comes from the American Humanist Association, which demands that the cross be removed because it sends “a clear message that Christianity is the preferred religion over all others.” Last year, a panel of the Fourth Circuit US Court of Appeals endorsed that claim, ruling that the Peace Cross is tantamount to an endorsement of Christianity, and an unconstitutional use of public funds and property. The American Legion, which intervened to defend the cross, petitioned the Supreme Court to review the case. The storied veterans group was a key sponsor of the memorial; its emblem (a star bearing the initials “US”) appears prominently in the center of the cross. The petitioners argue that unless the Fourth Circuit is overruled, cross-shaped memorials on public land everywhere — such as two prominent World War I monuments at Arlington National Cemetery — will be endangered. More generally, the American Legion is asking the high court to clarify what constitutes “an establishment of religion” under the Constitution, and to make clear that there is nothing improper about religion-infused displays that are consistent with American custom. Everyone agrees that the Constitution bars the government from using its power to coerce religious belief or practice, to penalize dissenters, or to affect religious doctrine. But what about a passive monument like the Bladensburg Peace Cross, which doesn’t compel anyone to do anything? Does a memorial shaped like a cross violate the Establishment Clause simply because it is exhibited on public land? Of course it does, says the American Civil Liberties Union, insisting in an essay at Scotusblog that the case “should be a no-brainer.” Any display featuring a cross is obviously meant to honor and represent Christianity, ACLU senior attorney Heather Weaver contends, and the Constitution forbids the government from sponsoring such a display. But if anything about this case is a no-brainer, it is that the Supreme Court is not going to ban a World War I memorial that has stood, without objection, for a century. The justices will not rule that any appearance of a cross on the public square is by definition an unlawful attempt by government to advance religion. All of which means that if the court is inclined to decide this case on narrow grounds, it can do so by restricting itself to the nonreligious connotations of the Bladensburg cross. But the American Legion is asking the court to go farther. It wants the justices to rule that a government’s use of religious imagery and language, so long as they are in line with longstanding American traditions and practices, will be presumed unobjectionable under the First Amendment. At times, the court has recognized the legitimacy of those traditions and practices. “There is an unbroken history of official acknowledgment by all three branches of government of the role of religion in American life from at least 1789,” Chief Justice Warren Burger wrote for the majority in Lynch v. Donnelly, a 1984 case upholding the lawfulness of a Pawtucket, R.I., Christmas display that included a crèche. The First Amendment has never required official coolness toward religion. Indeed, the same Congress that adopted the First Amendment also hired congressional chaplains. Presidential announcements, such as the annual Thanksgiving proclamation, have often been cast in religious terms. “In God We Trust” is the national motto. US postage stamps commemorate Christian, Jewish, Muslim, and Hindu holidays. None of these amounts to an “establishment of religion,” as the Framers of the Constitution understood that term. Neither does the Bladensburg Peace Cross. However much the ACLU and the American Humanist Association may wish it were otherwise, the First Amendment does not require governments to scour every allusion to religion from public spaces and government budgets. The Constitution is friendly to religion; it is only hostile to religious coercion. The difference between the two is usually wide and clear. The Supreme Court has often suggested as much. Now it ought to say so explicitly.